I’ve had a mixed experience with Nobel Prize winners that I’ve recently read. The Piano Teacher by Elfriede Jelinek was challenging to say the least, and Auto-da-Fe by Elias Canetti was bizarre. On the other hand, Beloved by Toni Morrison was a revelation, and The Double by José Saramago was very entertaining. But Wandering Star aroused intense feelings of melancholy about the Arab-Israeli conflict and of anger about international indifference to the persisting plight of refugees all over the world. J.M.G. Le Clézio was awarded the 2008 Nobel Prize in Literature as an ‘author of new departures, poetic adventure and sensual ecstasy, explorer of a humanity beyond and below the reigning civilization’ – and I bought Wandering Star, the only one of his books available in English, shortly afterwards. Now that I’ve finally read it, I understand why he won the prize. Alison Kelly’s review at The Guardian explains that Le Clezio wrote experimental fiction in his first phase as an author, but that Wandering Star reverts to using ‘conventional modes of storytelling complete with familiar devices such as characters, settings and plots’. Since I haven’t read any of his unconventional works, I can’t comment on the full scope of this author, but (despite the pedestrian translation) this book shows a writer in great command of his powers. In this novel he has tackled that most intractable of geopolitical issues, the Israeli-Palestinian conflict from the point of view of two young girls, both of whom are ‘wandering stars’ in search of a home. Esther is a Jewish refugee in post-Holocaust Europe, and Nejma is a dispossessed Palestinian. Their parallel stories illuminate the anguish of exile. Le Clezio sets up one of his central concerns, the universal sense of connection to place, in his earliest chapters. War is initially off-stage as we read about Esther’s idyllic childhood in a small village in Saint-Martin-Vésubie during the hot summer of 1943. The village is occupied by the Italians, but their regime is comparatively benign and they conspire with the locals to frustrate Nazi deportations of Jews. For Esther, who is thirteen, inchoate menace is beyond, where the road leads up into the mountains and the dark forest of larches where the wolves are. It is as if she is living in a Grimm’s fairy tale, safe as long as she does not venture where she has been told not to go. But the menace intrudes into her Eden. The village has become a transit point for refugees from Paris, from Poland and from Russia, and there are strange new accents and odd kinds of poverty among the crowds who throng its formerly quiet streets. Mr Ferne from Vienna whose wife ‘was taken away’ by the Germans when they invaded Austria plays haunting music, and Tristan O’Rourke watches the meticulous recording of the Jews on registers. Tristan fled Cannes with his mother after his father went off to fight in the war – he could be a wandering star too, but Le Clezio doesn’t follow his story. Esther – nicknamed Estrellita (‘Little star’) by her loving father – must always be called Hélène out-of-doors. She runs wild because the school has closed down. She overhears her mother remonstrate with her father about it and he replies that she should let the child be because ‘these might be her last days’. She has been taught to deny being Jewish and to say nothing about her father’s activities. He’s a non-religious Jew and a Communist, but he helps Jews across the mountains; her mother lives in constant fear. David Malouf in his brilliant essay On Experience talks about the change in world consciousness after the Holocaust. Our parents, he said, grew up in a world where it had not happened. We grew up to realise that it wasn’t possible to have that lost sense of innocence ever again. What Le Clezio has done here is to recapture Esther’s childlike faith that nothing bad could ever happen up there in the valley; we who read it see only too clearly those vipers she pays no heed to in her Garden of Eden. We see that renaming of Esther as Hélène as the futile stratagem that it is because the family is on that register and must line up each week to get their ration cards. We know that when Gasparini challenges Esther to explain what her father is doing to help in the Maquis (the rural arm of the French Resistance), her revelation that he helps Jews across the mountains to Italy is perilous. When the Italians are defeated the Germans arrive, so the Jewish community begins a fruitless trek to freedom across the mountains. With great restraint Le Clezio includes very little about Nazi genocide; it is sobering to discover that this is because Esther is so traumatized that she is unable to think of it. The narration switches from omniscient third person to first person narrative in this section to show the roller-coaster of emotions as Esther’s hopes for a sea passage to Jerusalem falter and she waits it out with her dispirited mother in a French prison after capture. And then these already traumatized people must deal with the 1947-48 Civil War in what was then Palestine. Having enlisted the reader’s sympathies for Esther and the tragedy of her people, Le Clezio then subverts expectations by introducing Nejma, a dispossessed Palestinian refugee, a symbol of what Palestinians call The Catastrophe. In the one fleeting moment of contact between these two girls in the story each recognises the humanity of the other. It’s a powerful symbol at the heart of this book. Throughout my adult life I’ve seen footage of refugee camps of one sort and another, but the picture Le Clezio paints is nothing like the well-ordered camps I’ve seen on TV. Behind the barbed wire, Nejma calls the Nour Chams (sic) Detention Camp  a prison, where the inmates are given only the most miserly shelter and rations by the United Nations. Supplies of food and water are completely inadequate, and plague breaks out. People die in their thousands, and hope for a better future dies despite Nejma’s initial resilience. 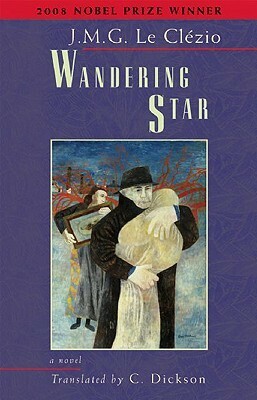 The wandering star is a perfect symbol for this story and its central characters. It is not just that the girls are in endless search of a secure home. In the classical world, the planets (i.e. the ones that were visible to the naked eye) were called wandering stars. Nejma and Esther as symbols for Palestine and Israel are as central to world peace as the planets are to the stability of our solar system. This book is a reminder that the Middle East conflict is not just a regular item on the nightly news, but is about real people caught up in intractable conflict. Jacqueline Dutton has an excellent review at the Radio National Book Show. The Nur Shams Refugee Camp is still in operation. I am not sure if Le Clezio’s implied criticism of the UN’s humanitarian role In 1947-8 is entirely fair. The United Nations had only just been set up after its creation in 1945 and had its first meeting in 1946. Its humanitarian work was in its infancy and they may not have developed effective delivery systems to deal with crises at that time. On the other hand, the UN’s hasty decision to partition Palestine has caused nothing but trouble ever since, and it was certainly their responsibility to provide humanitarian relief for any and all of the refugees. My goodness, Stu, you were quick! Thanks for this info – I’ll do a search to see what else I can find because on the strength of this book, he’s very interesting. Hello, your review is excellent. It seems I didn’t start with the good ones. One anecdote: I remember seeing Le Clezio on TV (before the Nobel Prize) and the dumb journalist thought intelligent to ask him “how does it feel to be so handsome?” Now if men get asked that kind of questions too, when will it stop for women? Oh dear, he gets the Nobel Prize and reporters label him as eye-candy! When you do read this, can you get back to me about how it reads in French? The translation was a bit ponderous here and there and so I’m wondering what his writing style is really like. Now I can answer your question. His style is poetic and I’m not sure it translates well into English. He’s one of these writers with an ornate prose linked closely to the music of the French language. He’s rather difficult to read and I can’t translate quotes by him, I don’t know how to take the sentences and give them back in an intelligible English without betraying the beauty of the French. Ah well, that’s a spur to me to keep going with my French. I’m still going with George Sand’s Indiana, and then maybe I might try something modern. And short! Modern and short? Try Philippe Djian or Delphine de Vigan. Modern, and short, and grammatically ordinary! Most often we don’t see conflicts that way – as humans like us caught up in misery. We usually distance their feelings from our feeling. Else how could one justify the killing of innocent people? how could one rejoice over the death of another. Thanks for this academic review of a book I would love to read. Hello Nana, how nice it is to have a reader all the way from Ghana! How readily available is European literature in Ghana? I had to order this from overseas, I’ve never seen it in an Australian bookshop. A most wonderful review, Lisa. Loved your intro about Nobel Laureates. le Clezio is on my list of writers that I want to read. In fact, I’m interested in his experimental fiction. I did not know that he wrote more conventional narratives. I think I might check out his experimental stuff too, at some stage. Just when I begin to think, well that’s it, there’s nothing more that can be done with the novel – I discover another experimental novel and have to revise my ideas. I love it! Do you ever listen to the World Book Club Podcasts? There was a striking one with this author sometime last year (I just listened to it, but I know I am woefully out-of-synch with the actual broadcast times.) He does speak directly to the matter of having received the Nobel but I particularly enjoyed the short excerpts that he read: such marvellous cadence and resonance. Oh dear, I am embarrassed to be re-reading this post and only now discovering that I didn’t reply to your comment. I’m so sorry, I don’t know how I overlooked it. Anyway, to answer your question, no I don’t listen to podcasts much. I know there are some real treasures out there, but because I don’t use my iPod much, every time I connect it to my computer there seems to be another update which takes forever to download and install, and it seems too much of a hassle to keep downloading the things I subscribe to.